Have you ever found yourself wanting more information while reading the packaging on a tool? Having the most information sure makes your choosing the right tool a lot easier, but there is only so much one can fit onto the packaging. The smaller the package, the less information we get. Johnson Level is changing all if this with the addition of QR codes on their product packaging. QR codes are similar in function to barcodes and contain small bits of information. 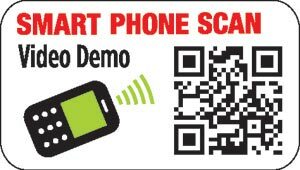 These codes can be scanned with most of the newer smart phones by simply installing a free QR reader application. When a QR code is scanned from the packaging of a Johnson product, the QR reader will read the code and direct you to the Johnson Level website, or to a specific webpage where more information can be found. The codes will be primarily used on Levels with special features and more technical products such as laser levels. In addition, Johnson will be using these codes in their magazine ads. If you have a smart phone with a QR reader app and you come across a Johnson Level QR code, let me know what your experience is.